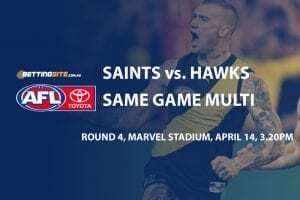 This week’s Thursday night blockbuster will be played between the Sydney Swans and the Geelong Cats at the SCG. After both sides suffered heartbreaking losses in their most recent matches, this week takes on even more importance. 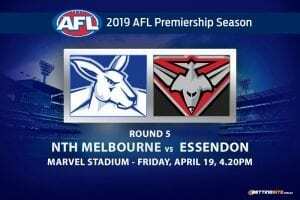 Sydney need to win in order to keep its top four hopes alive and healthy, whilst Geelong are in a far worse predicament. 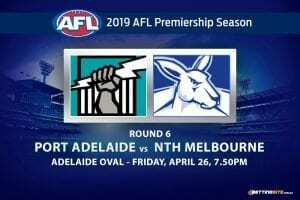 If the Cats are to lose, the top eight starts to look out of sight, as plenty of sides are willing to take their spot. 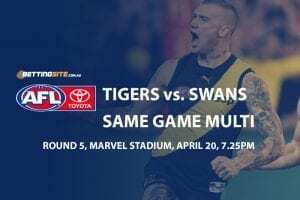 The Swans were blown out late when they faced the rampaging Richmond Tigers last week, mainly due to losing structure up the ground as Isaac Heeney suffered delayed concussion and was forced to sit out the match. The Cats had no injuries to speak of, but lost to the depleted Bulldogs, who fought harder than the Cats in a thrilling Friday night encounter. The Cats suffered the same malaise post-bye that has effected them and so many other clubs over the last few years. 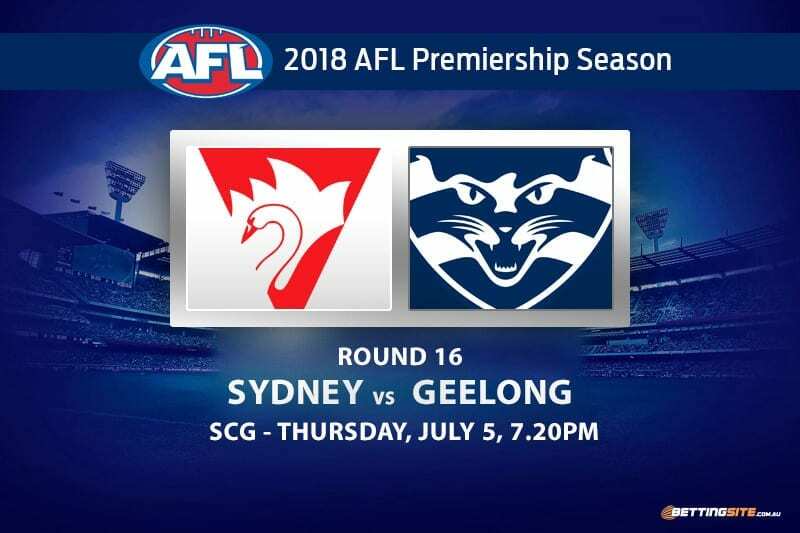 The match is being played at the SCG, giving the Swans a slight edge, but Geelong has a reputation of responding with their backs against the wall — we’re expecting a thriller. Here are the tips we believe are going to fill our betting accounts this Thursday. When looking at how teams score early, the most crucial detail is the centre clearance. When comparing the two midfields, it was easy to make this conclusion. With Patrick Dangerfield, Gary Ablett Jr and Joel Selwood all keen to make an early statement, we expect the Cats to be on early. Last week across both matches including these sides, the third quarter was the highest-scoring. In the Swans case they kicked nearly half in the term and the Cats too, put the foot on the pedal. We expect that trend to continue here. Not a whole lot of kids are bought into a side and are given a critical role in the forward line in their first or second year of football. If Will Hayward was playing for a Victorian-based side, he’d be getting a lot more attention. The kid can play and he bobs up when the game needs a goal to be kicked. We think Geelong may struggle for a match-up for Hayward in the air and on the ground, meaning he will kick a couple of goals this Thursday. The little master has mastered his craft when it comes to finding the footy and using it wisely. We have no interest in how well Gary uses the footy, but are intrigued by how well he accumulates. With plenty of chances to go for handball receives and the classic one-two, Gary Ablett Jr is adept at racking up the numbers. Round 15 was one of the highest-scoring rounds of the season, and we expect the trend to roll through to this week’s matches too. 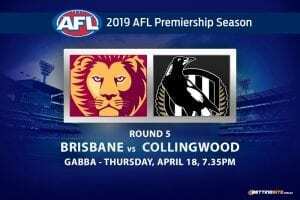 Geelong used an offensive style to pick its way through the Bulldogs defence and we see the Cats doing a similar job this week as well. Swans matches this year average around the 160-point mark each week. If this week goes overs we win. 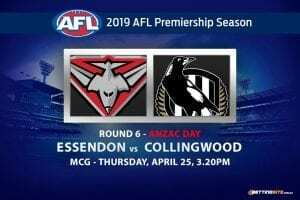 The Swans will win, but the match will not be an easy walk in the park. The concussion Isaac Heeney suffered may prove costly this week as he could sit out. If Heeney does play the Swans will win by more than expected, but if he doesn’t, expect a nail-biter.